I tried a new kind of snus today. Offroad Eucalyptus White Mini portions. When I opened the snus can I was hit by a strong scent of Eucalyptus. Reminds me a little bit about when I had a cold once and had to smell this menthol product called Vicks that cleared my head. It definitly smells like Eucalyptus is supposed to smell. 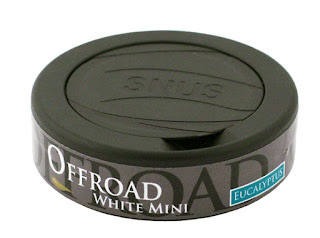 The first thing I noticed when openening the can was that the snus pouches didn't really look like white pouches. Or at least not as the white pouches that I am use to. They look a little more brownish and not as fresh in my opinion. I must say I prefer the pouches of Mocca White, and Catch White. The reason for this is that I think the Offroad pouches tastes a little bit like paper. They are very soft though and that is good. Feels comfortable. The taste is very fresch and reminds me a bit about summer. It does't taste as strong as it smells but it burns a little on the inside of my lip after keeping it in my mouth for a while. I find the taste to be a little salty like Catch Eucalyptus and not as sweet as other snus that i've tried. Regarding the nicotine content this is a little to weak for me. I'd rather use the original size portion to get some more nicotine but it is to big to fit under my lip. The offroad Eucalyptus white mini portion contains 8mg/g of nicotine. Offroad was earlier called Fellinni and had a more feminin design to the cans. I did'nt like the design of the Fellinni cans because I thought they looked a little too old-fashioned. I can't say I like this can better eather. I'd like to see a can that is a little more classy. A snus can that I would be proud to show off and keep in my handbag. It doesn't have to be very girly but just a little less boyish. I like the General Smooth White Medium can. It has a very simple but good looking design. Could be a little bit thinner though. Conclusion: The taste of the snus is very good. The smell is quite strong but nice. Comfortable pouches that fits well in the mouth. Not my favorite snus but absolutely a snus that I can see myself using. Since this is the first snus review I've ever written, please have a little patience with me. I'd love to get some constructive criticism to help me get better at this!